Conveniently located off of I-94 at Old Orchard Road. Need transportation? We highly recommend CarbellaLT (www.carbellalt.com). CAUTION: Most internet mapping sites stop short of the entrance to the property which is off of Lockwood Avenue. Exit West On Old Orchard Road then turn left. 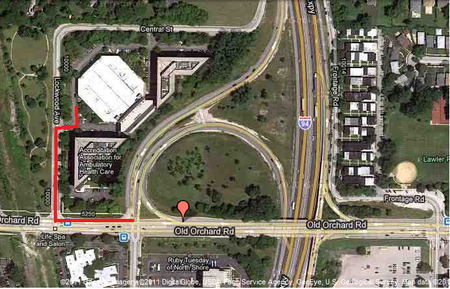 There is a stoplight just past the overpass that regulates the southbound On/Off ramp to I-94. Just past that light is a street named Lockwood. Shortly you’ll see a right hand turn lane into the 5230 complex. Take that right and then an immediate left, heading towards the entrance to the parking garage. Take the parking garage to the third floor. Enter thru two sets of doors and follow the signs to the Block Center. Exit West On Old Orchard Road then turn right. The next street on your right is Lockwood. Exit East on Dempster Ave. Shortly after you exit there will be a light at Potter Road. Take a left on Potter. Take Potter until it ends at Golf. Take Golf to Woods Drive. Take Woods until it ends at Old Orchard Road. Turn Right on Old Orchard Road. Take Old Orchard Road to Lockwood, just before stop light.